PamKittyMorning: Classic and Vintage: Bear Paw! Good morning! Today we're stitching along with Fat Quarter Shop's BRAND NEW Classic and Vintage Block, The Bear Paw. Classic and Vintage is the perfect series for me, because I love making the old blocks new again with fresh fabrics and colors. Fat Quarter Shop's instructions for this block can be found here, and as you've come to expect, they're clear and concise, and you can whip up a block in no time! The generous size of 14 inches makes any project go fast. Just get your Alphabitties at the ready, download your pattern and get started. In no time at all you'll have a nice crisp Bear Paw Block ready to be called to action! 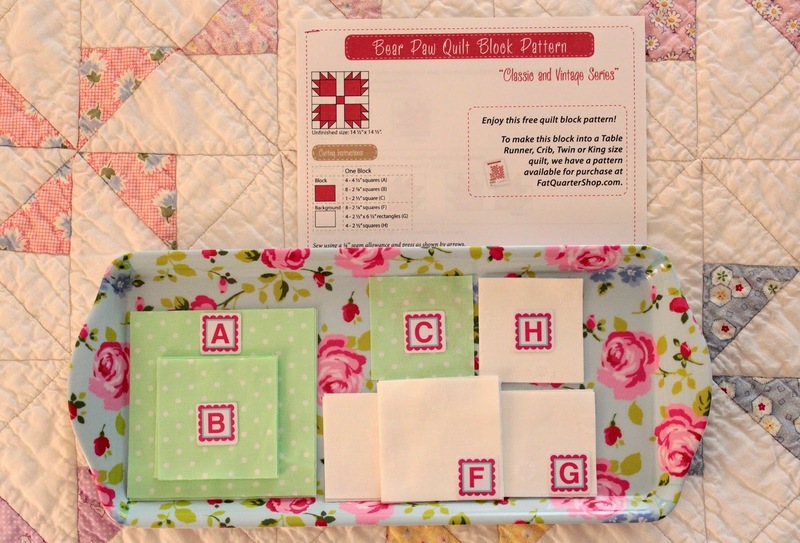 Fat Quarter Shop also has a new video showing you how to make the Bear Paw Block. Kimberly demonstrates how to use Triangle paper in it. You'll have a nice neat Bear Paw Block in no time. I totally got carried away and made a small block too. 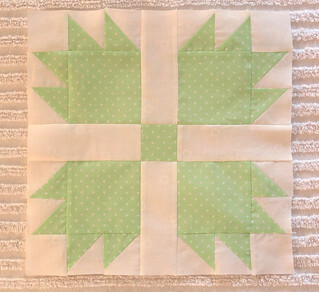 The Fat Quarter Shop has a free download for the Bear Paw Block. 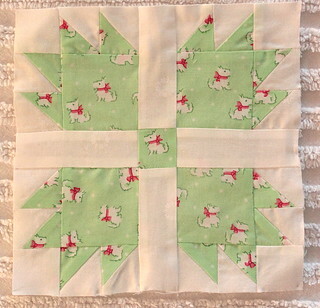 They also have a perfectly priced pattern for a table runner, crib, twin or king sized quilt, you can order that here. Now I hope you'll head over to the Jolly Jabber and see who else is making Bear Paw blocks! 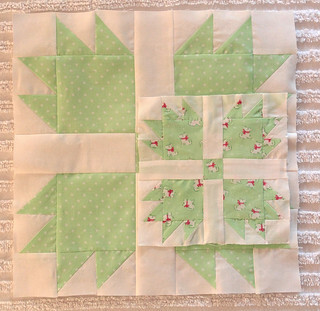 I really like the fabrics you are using and the little block is too cute! Loving the green in those blocks! Oooooh, I do not have the green Scottie Fabric!!!!! love your bear paw blocks! Your mini is just too adorable! That is such a fun block! Love your block. Those scotty dogs are very cute. I can't wait to see what you make with your garden fabric. Like the colors you are using!